Old School Pinning has been made possible by Shutterfly and Looksi Square. Okay, I know what you're thinking. "Is she crazy?? I take hundreds of pictures a day! There are more pictures on my iphone than my parents took in their entire 50 year marriage." And you're right, of course. I can't argue with that. But here's the problem: these days most of our pictures are stuck inside our phones, computers and ipads, never to see the light of day again. So I am on a mission, a mission to free the pictures! I want to see them out on display in my house. I want people to walk by and ooh and ahh over the cuteness and beauty that I have so brilliantly captured. Luckily my friends at Shutterfly (via my friends at the inspirational website Looksi Square) have offered me some free prints so I can get started on my quest. So here's another modern dilemma: with so many pictures to choose from, it's hard to decide which ones to display. For that reason it makes sense to have a rotating display, something that can be switched out quickly and easily. There are lots of display options out there and I decided to go with a pin board--a big one--something I could put lots of pictures on at once. The first place I looked was Pottery Barn where I was instantly smitten by this beautiful linen pinboard. I was not, however, smitten by the price: $159.00 for the largest version (plus $21.00 for shipping). Ouch! I had a similar reaction to this $219.00 version from Ballard Designs (and don't even get me started on the $270.00 one from Restoration Hardware). Just when it was looking like my pictures would stay forever trapped inside my phone, inspiration struck (as it often does) in the hallowed halls of Home Depot. In case you're wondering, it's a piece of foam board insulation. It's two feet wide by four feet tall and it cost a whopping $4.95. There were other pieces (muuuch bigger pieces) that cost about $15.00. AND the nice Home Depot men said they could cut the big pieces down to whatever size I desired. The styrofoam is about one-and-a-half inches thick and it is super-light. That's right, a canvas painter's drop cloth. 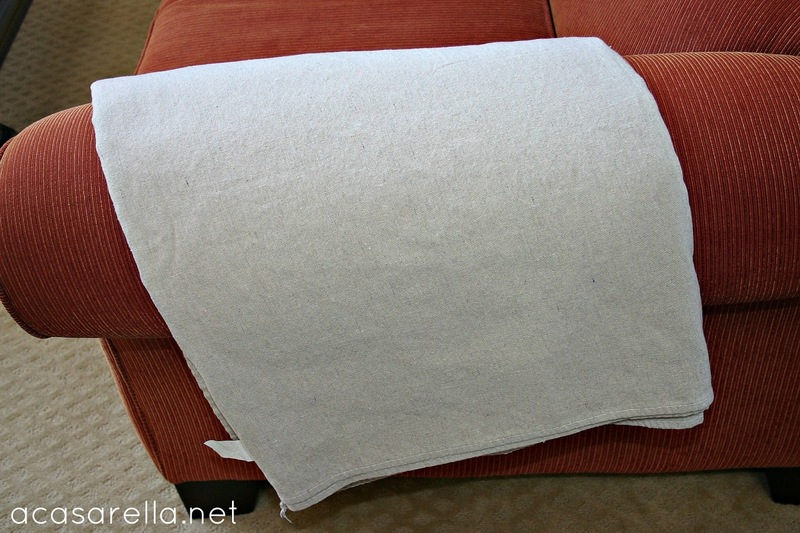 Canvas drop cloths are right up there with paint chips and mason jars on the list of items that bloggers love to repurpose and craft with. 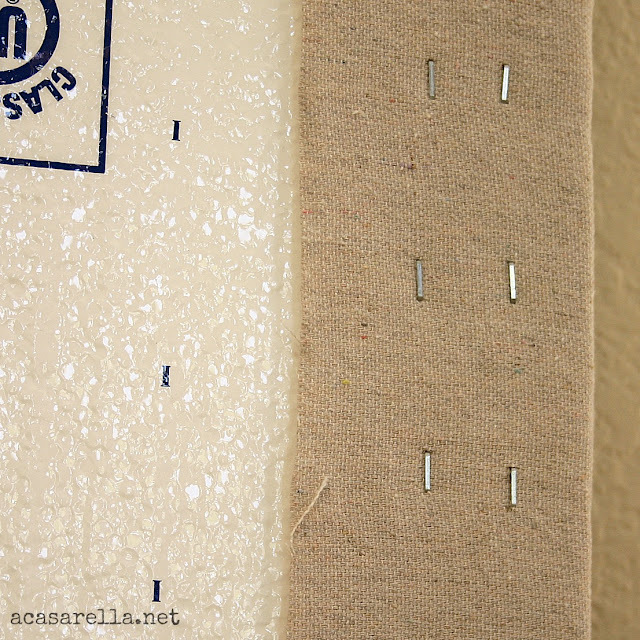 As you can see above, I put the foam down on top of the drop cloth (which I cut so it wasn't so big), pulled it taut and fastened it with thumbtacks. The thumbtacks weren't permanent; they merely held the fabric in place so I could staple it just the way I wanted. The corners were a bit of a challenge. I ended up folding them over, kind of like I was wrapping a present. They're not perfect, but I doubt anyone but me will notice. Isn't this a great way to get those photos off the computer and on display? And the whole thing cost less than $20 to make. It was so inexpensive that I am currently envisioning several of them hung side by side in an office or crafting space. Wouldn't that be pretty? Love it! That pin board is super cute. 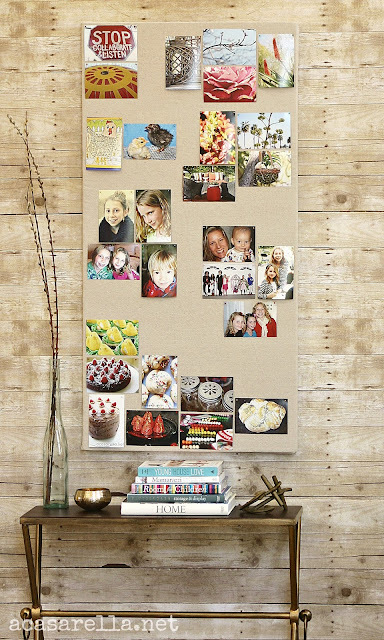 I've been meaning to do something similar to the cork boards in my office at work - I'm tired of brown! Congrats on your first sponsored post!! WOW. How brilliant. I have corkboards up BUT this looks so much better. You nailed this version of a knock off perfectly. And, I love that you are liberating your pictures from your computer! Genius!! You "nailed" it (pun intended LOL)Elena! I love the use of the drop cloth and you probably have enough left to make some as gifts. Oooh...maybe the perfect display of pictures at a wedding reception. Okay...yeah...I love it! Fabulous look Elena! This is gorgeous, so copying you!! Great job Elena! I LOVE how it turned out- I also love how you write- I feel like we're friends by the way you speak through your writing. I'll be sure to link your project in my post as well! Lady, you're a genius! I love this! Super cute - love the scale of it. I need to get my pics off the camera and onto the wall! 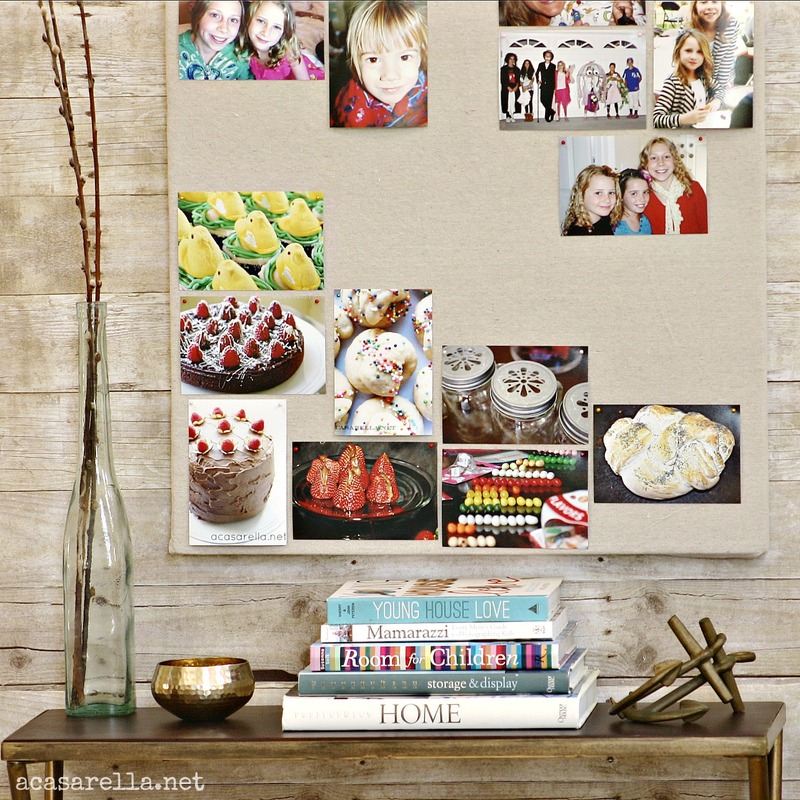 Your Pin board looks great!! This is fabulous! I've been planning a pin board for my newly remodeled craft room, so I think I'll be borrowing your idea! Thank you!! Super cool! I love to display *real* pictures, too. I found you thru a link on Facebook by Suburble. I'd love for you to share this at my linky today, I hope you can stop by! So cool and frugal!!! I am so doing this very soon!! Thanks for the awesome idea! LOVE. 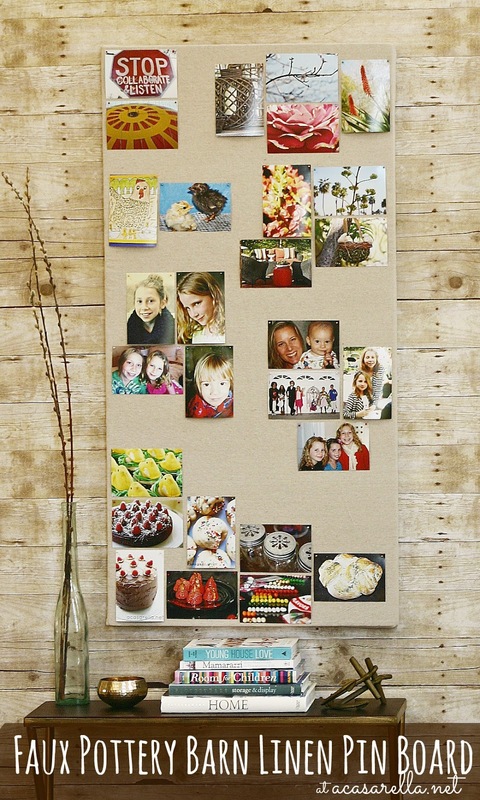 I've been looking for an inexpensive way to display pictures and this is perfect! Thanks for the idea, pinning! Wow! That's wonderful! I love that you used actual printed photos, you're right - so many of them just languish on our phones these days! So glad I found this post! 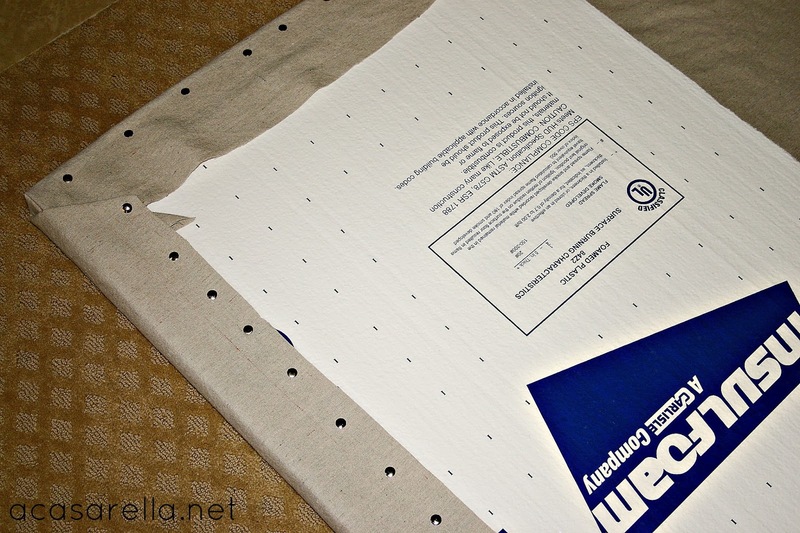 I recently made a large wall calendar (http://craftivitydesigns.blogspot.com/2013/04/how-to-make-large-wall-calendar.html) and used foam board + cork board + batting. It was pretty pricey and I knew there had to be a cheaper way to get the same look. 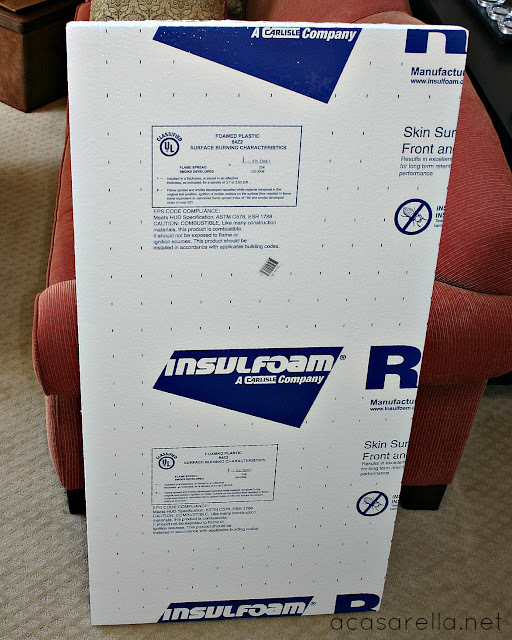 Foam insulation is such a great solution! Pinning! 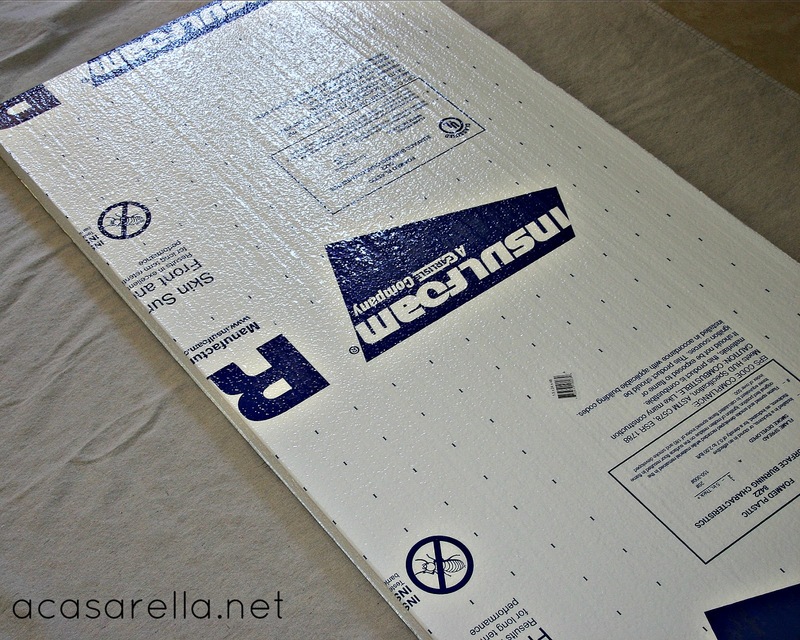 Did you put the fabric on the back side of the foam? 'cause it looks like you put what looks like "tacks" into the front (printed, smooth) side to secure the fabric after it was pulled around from (whatever side side you used) the front. Also, LOVE the "wood plank" background wall. Did you make it also? Do you have a link? 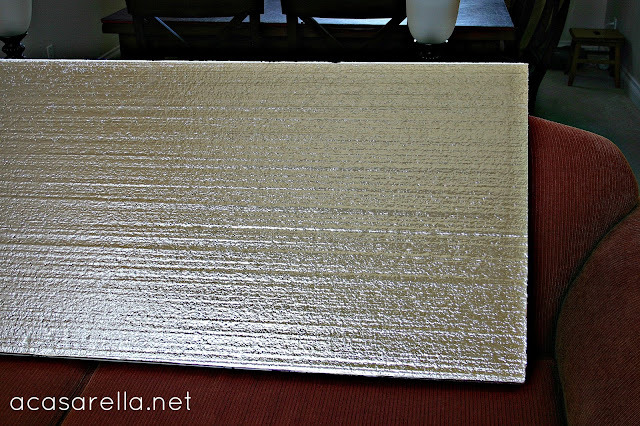 Okay, so I put the foam board down on the canvas, with the silver side down. Then I pulled the canvas around and thumb-tacked it to hold it in place while I stapled. After the staples were in I pulled out the tacks. Love it, love it, love it! 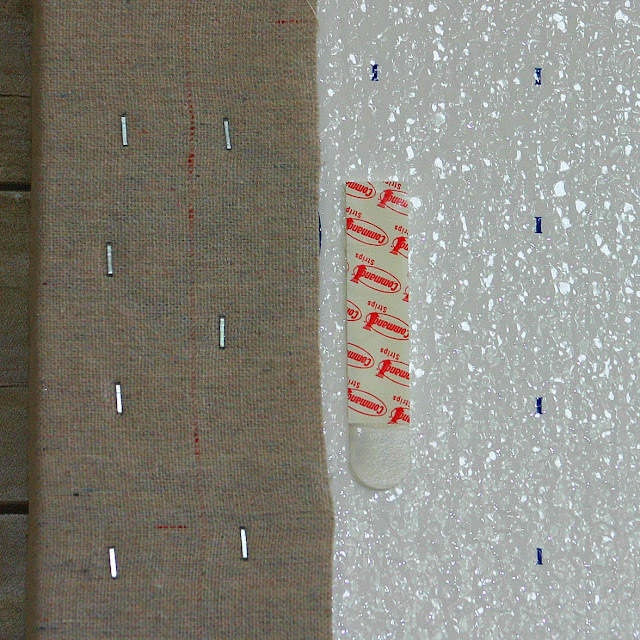 The fabric was such a terrific choice-it could really go anywhere in your home. Thanks for such a great tutorial and idea! LOVE this idea! It's perfect for anywhere in the house! We would love for you to share at our first Super Summer Saturday party here: http://www.thechirpingmoms.com/2013/06/super-summer-saturday-party.html! You've been FEATURED at the BeBetsy BRAG ABOUT IT Link and Hop Party No. 10. http://bebetsy.com CONGRATS TO YOU! Grab a featured button here http://bit.ly/11S2wN1 then tell all your friends and family - they will be impressed! I am SOOOOOOOOOOO with you going back to old school Elena! Hey Elena - I agree, I like to see my pictures everyday and ooh and aah over them. Great job! Could I do this with a canvas? 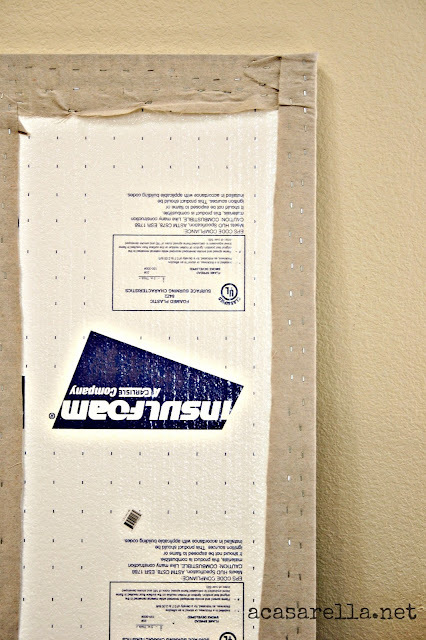 I have a large plain canvas from Michael's I got to cover an ugly fuse box. I was going to cover the canvas with fabric, but I like the idea of pictures even better, at least until I find a fabric I like (which is proving more difficult than expected!). Kridtin, the issue with canvas is going to be getting the pins to stay put. 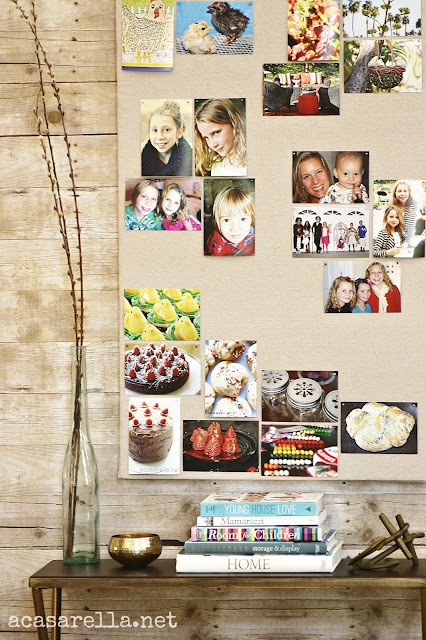 If you want to cover a canvas with pictures I would simply stick them on with Command Poster strips. Hope this helps!